A man holds the horns and nasal septum of a tethered milking cow whilst another holds its tail in preparation for blowing up its uterus to help it produce milk. This was often done for cows whose calf had died, in combination with a tulchan made from the dead calf's skin placed next to the cow for it to smell, visible in the foreground. This widespread practice among cattle keepers seems to result in the lactation of the calf's mother. Note on print reverse ms pencil - "83" & print front border ms ink - "NUER XII/34"
Morton, Chris. 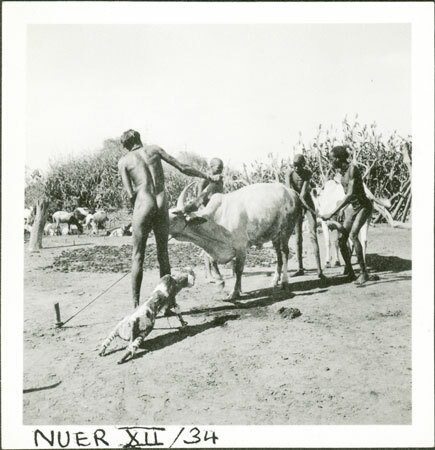 "Nuer cow treatment" Southern Sudan Project (in development). 03 Jan. 2006. Pitt Rivers Museum. <http://southernsudan.prm.ox.ac.uk/details/1998.355.563.2/>.